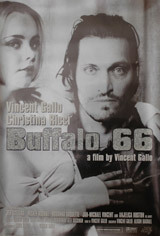 This is a very rare original Buffalo 66 poster with silver glitter. The glitter was added by Vincent Gallo himself in 1998. Only a hundred of these were made, and we have a very limited supply available. These posters have been in storage for several years, and there is some minor crumpling along edges. Also, please note the glitter does come loose with each handling, and professional framing is advised.